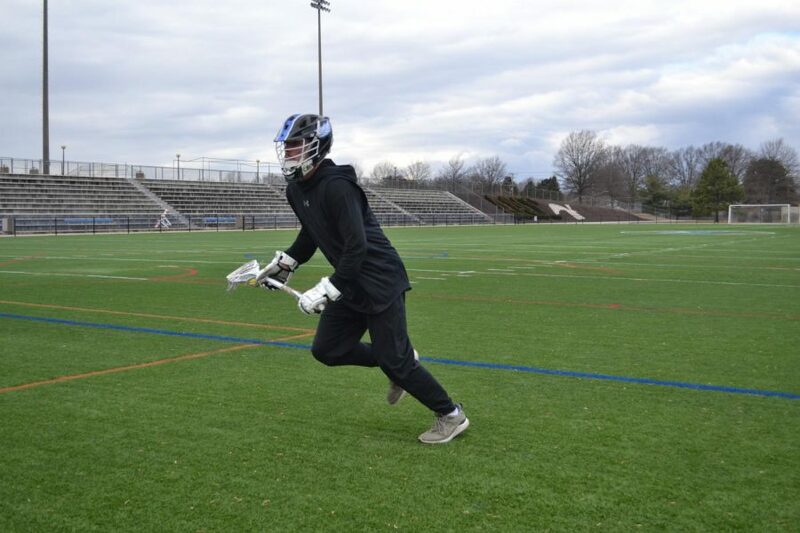 Second-year communications student Noah Reem, midfielder, prepares for the lacrosse season by working out on the turf. The team opens the season at home on Feb. 23. After going 8-4 last spring, AACC Men’s Lacrosse is looking to improve this year despite losing 16 players from last year’s roster. Among the departures are face-off starter Nick Karnes, who won first-team All-American honors for his performance last season but lost eligibility because of low grades, and goalie William Harrison, a second-team All-American goalie, who graduated. The others left because they transferred to four-year colleges or graduated; had played for two years and were no longer eligible for the team; or earned grades too low to keep them on the team. The team added 25 players for the coming season, including 10 first-year students. Third-year head coach Joe Stanilaus said having fresh faces every season has pros and cons. “We only get the guys for two years max anyway, so we know going in that we have to recruit very heavily to compete in our region and nationally,” Stanilaus said. Stanilaus added the team is looking for solid lacrosse players who are also good students. Sophomore attackman Rahsaan Johnson listed ways players can be fully committed this season. Stanilaus named second-year midfielders Jordan Kopf and James Dipietro Jr. as team captains. The team opens the season against Onondaga Community College at home.